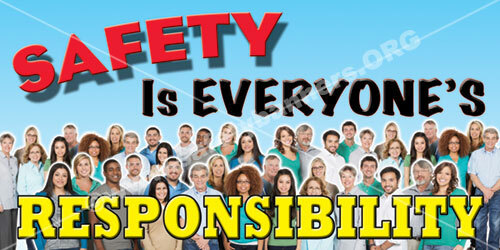 Safety Is Everyone's Responsibility is a slogan, and accompanying safety banners images, that were developed and copyrighted by SafetyBanners.Org in 2007. 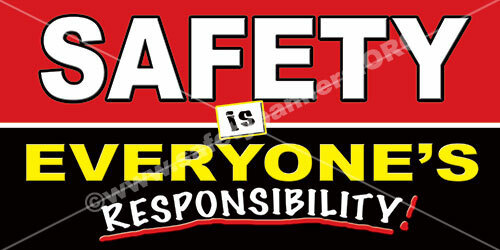 This slogan and it's associated safety banners images have been ILLEGALLY copied and used by other companies over 300 times in the last 10 years - 300 TIMES! 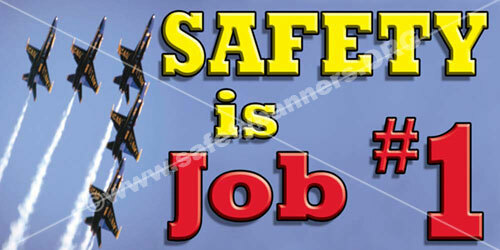 Over 150 of our safety banners images have been illegally copied and used by others. In 2013 we placed a copyright x-out on all our images. Since then the incidence of copyright infringement has decreased, but many many companies still use our safety images prior to our copyright x-out. Our attorney has has pursued removal action again many of these companies, but the large volume of copying our safety images and copyright infringement makes it prohibitively expensive. We are asking you, our over 12,000 wonderful customers, to help us out and not purchase these image products from sources who are illegally using them. Our company is very fortunate. Our success and becoming the number one safety banner designer and producer has helped us grow and improve, and we thank you for that. However, we are not happy that others take our hard earned work and try to profit from it. Thank you for your business and the opportunity to be of service.